Okay lets face it. A typical wedding is expensive! If you are here, you either know me or you want to save some money and not go crazy purchasing a wedding dress. Well, neither did I! Go us! :) There are tons of ways to get a beautiful wedding dress WITHOUT spending lots of cash. First thing you have to do is stop perusing the internet for styled weddings. Yes, those dresses are gorgeous BUT do you really want to spend $3,000 or MORE on a dress you are wearing ONCE? NO! You don't. Second, get an idea of the type of dress you want but keep your options open. Go ahead and visit the websites of the typical wedding dress retailers and some of the newer trending sites and FILTER by price. Set your budget and refuse to look at the dresses on the last pages. You are going to fall in love with one of them and you will want it. And don't be afraid to look at the Bridesmaids dresses. Many of them are simpler, trendier and come in ivory or white! Here are some of the sites I looked at. These are all $99 at David's Bridal! If you find the dress, read up on the details, talk to the previous owner and if the price is right, go for it. If not, run a filter for your size and your price range. Don't go over because once again you will find something else you like that does not fit the budget. I mean, you still have to get a veil, flowers, jewelry, etc! 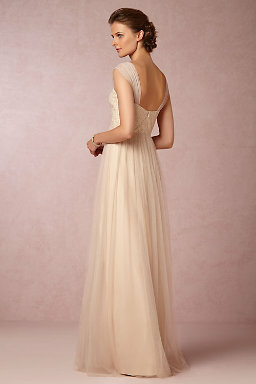 If YOU STILL haven't found a dress, consider checking out some of your favorite stores and looking for white dresses. The ethereal look is in now so if thats what you are looking for then you can find lots at BCBG, Zara and other stores and maybe just a nice maxi skirt, or tulle skirt, or pencil skirt with a cute top will do! And if you are up for it, check out RENT THE RUNWAY. They rent wedding dresses for pretty cheap. If you live near a store, you can even book time with a stylist and they will show you all of their wedding-like dresses. You can choose from a whole bunch. They also giving you two different sizes the day of just in case you need to go up or down a size. I have actually rented a dress for my big day and I am in love with it. I'm still looking at other dresses but to be honest, the dress I found is PERFECT for my day and it was so cheap. The other thing is that their dresses are designer dresses. So you are not skimping out on quality!